Fish tacos will forever remind me of living in Mexico. The endless white sand beaches, the cerulean ocean, and the hot, hot heat. It was so hot that we hardly ever ventured out during the day. Instead we stayed inside the artificial cool of our condo, not wanting to brave the weather. One day, early on in our stay, I’d made the mistake of spending the entire day on the beach. I was rewarded with mild heatstroke and a bad case of sun burn. After that, going out during the day had to be for good reason. Fish tacos were definitely a good reason. A quick google search showed me that the place to go for fish tacos in Playa del Carmen was Dr. Taco. Dr. Taco wasn’t a far walk from where we were staying, but I literally felt fried by the time we got there. Me and heat aren’t really friends. Good thing the tacos were there to distract me: fresh and fast, the tacos came on tiny tortilla shells waiting for your choices from the fresh salsa bar. 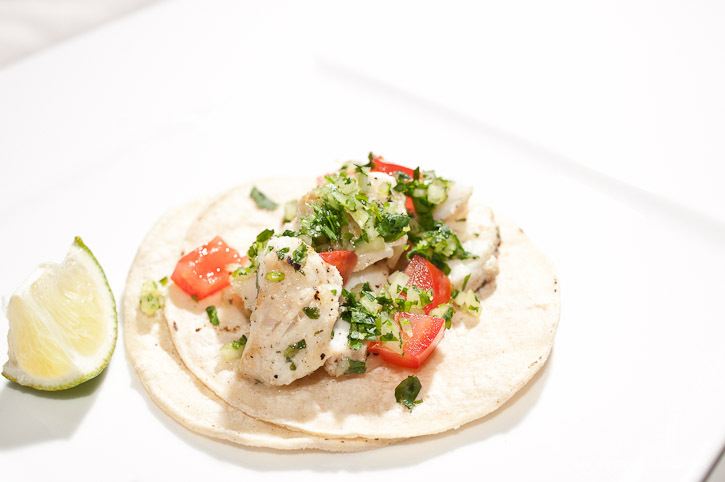 Fish tacos are great if you’re looking for a fast dinner idea. All you have to do is some quick dicing and pan frying and you’re ready to go! 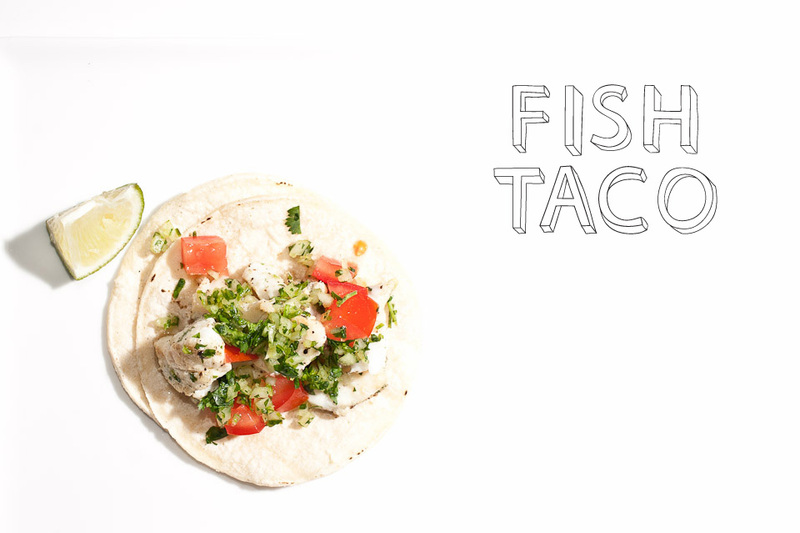 I am fresh, I am fast: I AM FISH TACO! 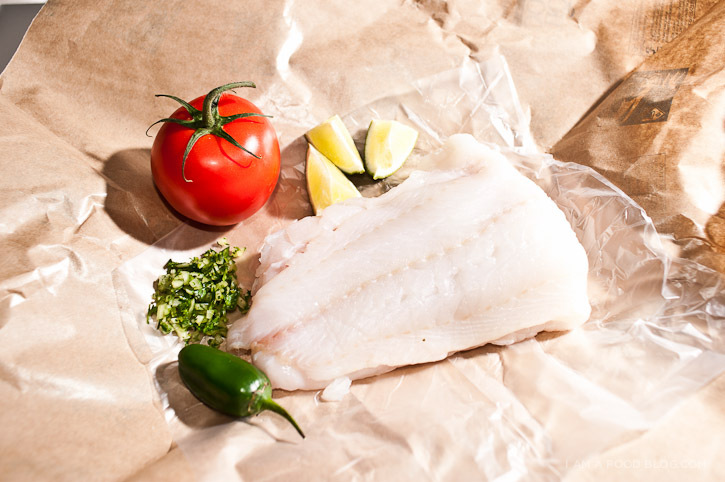 Combine the marinade ingredients and toss with the fish. 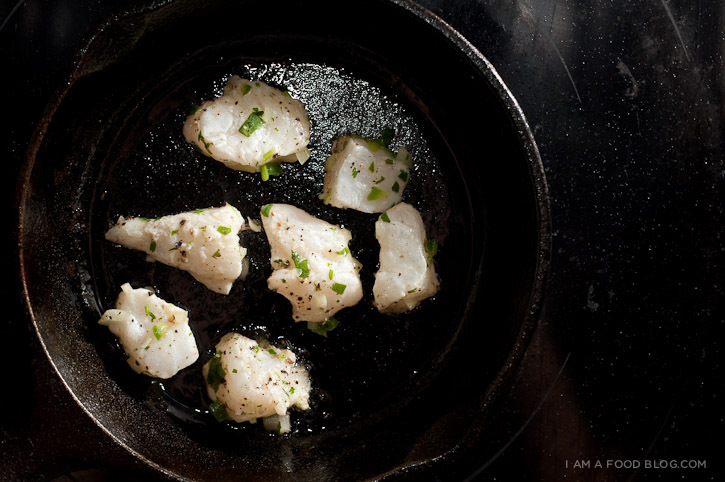 Heat a pan over medium high heat and grill fish chunks until cooked, about 3-5 minutes. Serve fish on warmed tortillas with the garnishes. Enjoy! Beautifully simple and utterly delicious! Definitely going to try this. Made this tonight – fabulous! What else can go good with this? 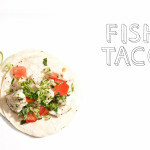 I love this no fuss take on fish tacos! Made this tonight and it turned out fantastic! Thank you! Wow. Me being the type of guy who prefers livers, bone marrow & cote de boeuf I did not expect to like this as much as I did. This one’s here to stay. I would highly recommend using cod cheeks instead though! Quite a bit cheaper (at least here in Amsterdam) and a hell of a lot tastier than the rather bland stuff one usually gets when buying white fish. Also, please dress it with your Salsa verde and avocado (recipe under Porchetta sandwich)! 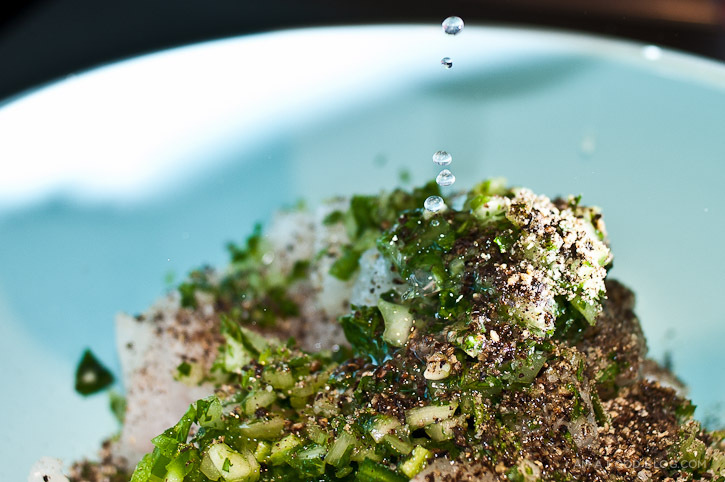 Counteracts wonderfully with the crisp acidity of the dish. Amazing recipe — simple and elegant! It certainly beats the deep-fried chum you get at chain Mexican food restaurants. I did these in a regular pan and regret not using my cast iron, but they still turned out nice. I used wild rock fish as that was all my supermarket had.